The Rockin' Axes at SFA will perform the music of The Strokes, Rage Against the Machine, Fit for a king, Pink Floyd, The Beatles and others when the student ensemble performs at 7:30 p.m. Friday, Dec. 7, in the Cole Concert Hall on the SFA campus. NACOGDOCHES, Texas - The Rockin' Axes at Stephen F. Austin State University will present a concert of rock subgenres ranging from classic rock to metal when the student ensemble performs at 7:30 p.m. Friday, Dec. 7, in Cole Concert Hall on the SFA campus. 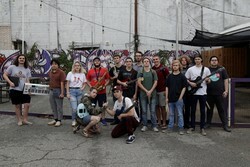 An ensemble within the Sound Recording Technology program in the SFA School of Music, the Rockin' Axes will perform works by The Strokes, White Stripes, Fit for a King, The Doors, Pink Floyd, The Beatles and a protest song by Rage Against the Machine, which contains some explicit lyrics. Rockin' Axes Director Nick Lambson, instructor in the Sound Recording Technology program, chose works based on the student performers' abilities and interests and that "provided the most opportunity for growth," he said. "In addition to enabling students to pursue what inspires them and work on their favorite styles of rock, many songs were selected to expose them to new music and develop particular technical and musical skills," Lambson said. The students will use music technology to recreate some works, including songs from The Doors and Pink Floyd, and the students did most of that work themselves, Lambson said. "We are a technology and music degree path, so I have been encouraging students to use all of our resources, where appropriate, and they did a great job, he said. "'Hey Jude,' played on our concert Steinway and featuring every member of the Rockin' Axes, will end the program.